Monday, June 23. 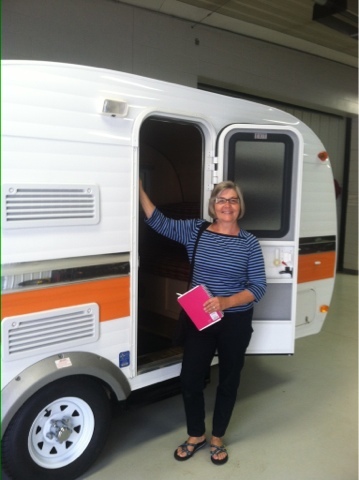 I am the proud owner of my third recreational vehicle! Yay! After breakfast this morning Pat and Roger followed me and Sue rode with me to Tomahawk where I saw my little Sierra Campfire trailer for the first time. It is exactly as it was described to me by the salesman, the condition is excellent, the birch wood interior is beautiful, it looks brand new, and it has everything that I need. I was a little surprised to see that it has a dropped floor (designed to give more ceiling height), so you actually have to step down right after you come through the door. I think I can adjust but it is probably my least favorite feature. I signed papers, then backed my car up to the trailer, it was hooked up for me, and I was on the road. Before I pulled out of the lot, I called my insurance agent to make sure that I was protected. We stopped at Walmart in Rhinelander to pick up a few essentials. As I was pulling into a parking stop, I tried to wave a lady past me and she declined. As soon as I stopped, she was peeking in the windows and asking questions about where she could find one for herself. I think it is going to be noticed by many and will become a conversation starter. I decided to go back to Jim and Sue's for the night to make sure everything works and Jim offered to teach me about backing up and connecting the hitch. We practiced several backing into a site several times and I'm beginning to get the hang of it. By the time we finished that, I was tired and ready for a break. Tuesday, June 24. I took my time this morning, loading up the few things that I brought along and trying to find space for everything. I will have to buy some plastic bins and baskets to utilize every possible space. 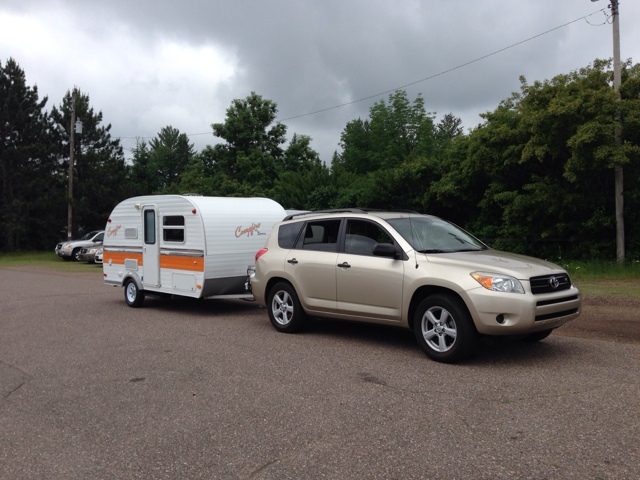 After a lesson on disconnecting and connecting to the car and one more backing lesson and hugs for my dear friends, I headed down the road with a plan to stop at a KOA near Stevens Point for the night. I made a stop at a grocery store so I would have dinner tonight and breakfast tomorrow, especially some coffee for the morning. Despite having heavy rain near Wausau, the trip was uneventful. It did take a lot longer than usual, since I couldn't drive over 60 mph, as dictated by my car manual. It also seemed like the gas gauge went down more quickly than usual, so I set the trip meter to check my mileage. It was almost 4:00 when I pulled into the brand new KOA that just opened a month ago. My site is beautiful with nice shade trees. Frisco and I took a tour and he seemed to be happy with the choice. I relaxed, caught up on some phone calls, and had my dinner and a glass of Wollersheim Prairie Fume wine, an enjoyable, quiet evening all by myself - it has been almost 2 months since I left my quiet home in Arizona. Wednesday, June 25. It was a quiet night and I went to bed early, probably was asleep by 8:30 - that was a first in a long, long time. I slept pretty good and Frisco found his sleeping spot too - a small space between the bed and kitchen cabinet. I had a nice chat with the owners of the park when I stopped by in the morning for coffee. They are very nice folks and they are building a beautiful campground. When I got back, I had some breakfast and then tested the water heater (it started right up and heated quickly). Then I filled the black and gray tanks so I could see if they worked and all is well there too. I got everything secured and headed to Stoughton, I'm ready to see Pat and to feel his hug - a year is way too long. I took several attempts but I was able to get the camper backed into a spot in the front yard with Pat's guidance. I got it leveled and found that one of the leveling jacks in the back is damaged, so I'll have to make a call to the dealer where I got it. Everything else seems to be fine and my site is beautiful, under the shade of a large tree with my door facing the front door. We all had a nice dinner and a great visit tonight. Friday, June 27. Today, my dear, sweet, Mom would be turning 92 years old. She died way too young and I think of her so often. It is also my nephew, Aaron's birthday, and I wish him a happy day. I started the day with a walk with Frisco and then discovered that it is city wide garage sales in Stoughton today, so guess how I spent the rest of my morning. I did find a few things that I need for the trailer, mostly baskets and things for organizing my stuff. Pat decided to take a nap and I thought that sounded good too but then I decided that my feet needed some attention, so I gave myself a pedicure. It's been nice being with this part of my family again. The pace is certainly slower these days. Sunday, June 29. Yesterday, I drove to Mazomanie to be with the Shackelton family who was having a celebration of life for their father, Art. He and his wife were foster parents to my brothers, Randy and Ron, and they took them in when they had 6 children of their own and they remained a tight knit family all through their lives. Together, they built a beautiful log home in the shores of the Wisconsin River, a place I always enjoyed visiting. I have nothing but respect for him and Barb and what they did for my brothers. I got to see Randy but Ron was unable to make it. It was nice to see them all. Frisco had fun running around with about 4 other dogs and he enjoyed the freedom of being off the leash. Today, we just hung around the house, Pat and I worked in the garden this morning and planted some beans and squash. We're both hoping that it isn't too late. Randy called to see if I wanted to join him for lunch so we met Pam and Ron at Sunrise (the food isn't the best) and we had a nice visit. After lunch, we drove around some of our old neighborhoods in Stoughton and went out to the cemetery to pay our respects to Mom, Dad, and our brother, Rocco. When we got back to Pat's house, we had a FaceTime conversation with Ben and the kids. I miss being around them and it's only been a week.